When Sandy was young she wanted to be a Vet more than anything else in the world. As she got older she soon realized that science was NOT her best subject and grew up to become a wife, mother of 3 and work in the world of fashion retail. 40 years later she became involved with PAW as a member of the Board of Directors. ... A year later she became their Director. You will find Sandy at PAW nearly 7 days a week, wearing a sweatshirt, Goodwill jeans, tennis shoes and her signature WOOF ball cap. "For years Sandy wore high heels everyday, had make up on and wore a ball hat on the occasional weekend. 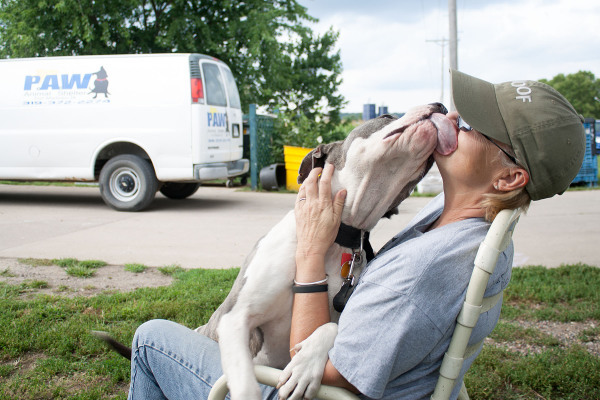 The people who knew her as such may feel she had lost her mind when she took this job, but in all honesty I think she has found her soul"
Fort Madison Protectors of Animal Welfare (P.A.W.) is a 501c3, non-profit No Kill Animal Shelter. Which began in 1997 by a small group of concerned citizens who saw a need and took action to fill that need. We have since grown into a facility that cares for almost 200 animals daily. ​Since our beginning, the shelter has found "forever homes" for thousands of lost, abandoned, abused and surrendered animals. We are proud to have adopted animals into loving homes in several states in the U.S. 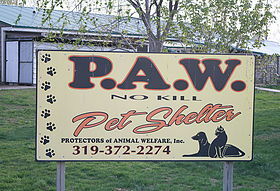 It is the mission of PAW animal shelter to provide a safe, healthy and loving environment for all animals in our care until they find their "forever home". It is our goal to some day be out of business for lack of animals to adopt. to provide a low cost spay and neuter cat program for the surrounding communities.